Are words worth a thousand pictures? Instagram is testing a new feature for adding text-only slides to Stories. The feature was first spotted in December, but Instagram is now rolling it out to users in other countries. According to The Next Web, which first spotted Type, it appears alongside the standard Live, Normal, Boomerang and Superzoom options when you create a new Story. You can type your text onto a plain background, choose a gradient, or position the text over a photo (which will have a gradient applied so the text stands out more clearly. 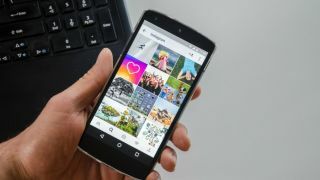 Stories, introduced in 2016, are a way to share several photos and videos from a single day without spamming your friends' main Instagram feeds. All the pictures and clips are gathered together into a slideshow, with drawing tools for adding doodles and captions. Instagram is working hard to develop Stories – possibly positioning them as a challenger to Snapchat. In October it added a polls feature (so you can gather votes on which delicious-looking salad you should have for lunch, for example), and in December it began letting users archive Stories so they don't vanish forever when they expire.